Minnesota Vikings wide receiver Adam Thielen will attempt to make NFL history on Sunday when they take on the Detroit Lions. Thielen has started the season in magnificent form, becoming the first receiver to begin a campaign with eight successive 100-yard games. That run has seen him tie Lions legend Calvin Johnson for the most three-figure receiving games in a row. He will look to surpass Johnson against the franchise where the receiver known as 'Megatron' spent his entire professional career. Thielen's streak comes six years after Johnson's, but how do his 2018 and Megatron's 2012 compare? We crunched the Opta numbers to find out. - Thielen has the superior catch percentage, hauling in 74 of his 96 targets (77.1 per cent), while Johnson caught 76 of 115 (66.1 per cent) over the same period in 2012. - Johnson was much more of a big-play threat, racking up 1,254 yards to Thielen's 925. However, Thielen has six touchdown grabs over the first eight games while Johnson had just four during his streak. - During the eight games in which Thielen has 100+ yards receiving, the Vikings are 4-3-1. While Minnesota have been able to post a winning record, the Lions were 1-7 during Johnson's streak. - During his record run, Johnson had five games with 10+ receptions. Thielen has three. 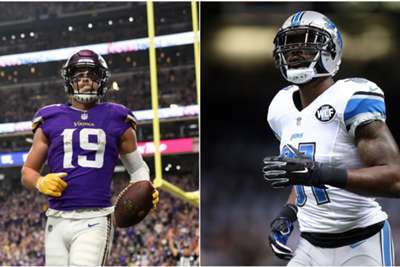 - The Lions were far more dependent on Johnson, who accounted for 37.3 per cent of Detroit's total yards in those eight games, whereas Thielen has 30.0 per cent of his team's total yards to date. - Alongside Thielen, Stefon Diggs also has three 100+ yard receiving games. While Johnson was amassing eight straight games with 100+ yards, only one other Lion had such a game (Ryan Broyles). - The yards per catch numbers back up Johnson's reputation as a greater big-play threat. Johnson had a 16.5 YPC average, while Thielen's number stands at 12.5. - Johnson's most productive game during his stretch was the last, where he had 11 catches for 225 yards – only 60 games have featured more yards by a single receiver and only nine players have accomplished the feat since his performance. - Thielen's highest individual yardage total during his run is 135. Johnson had five games with more than 135 yards during his streak.